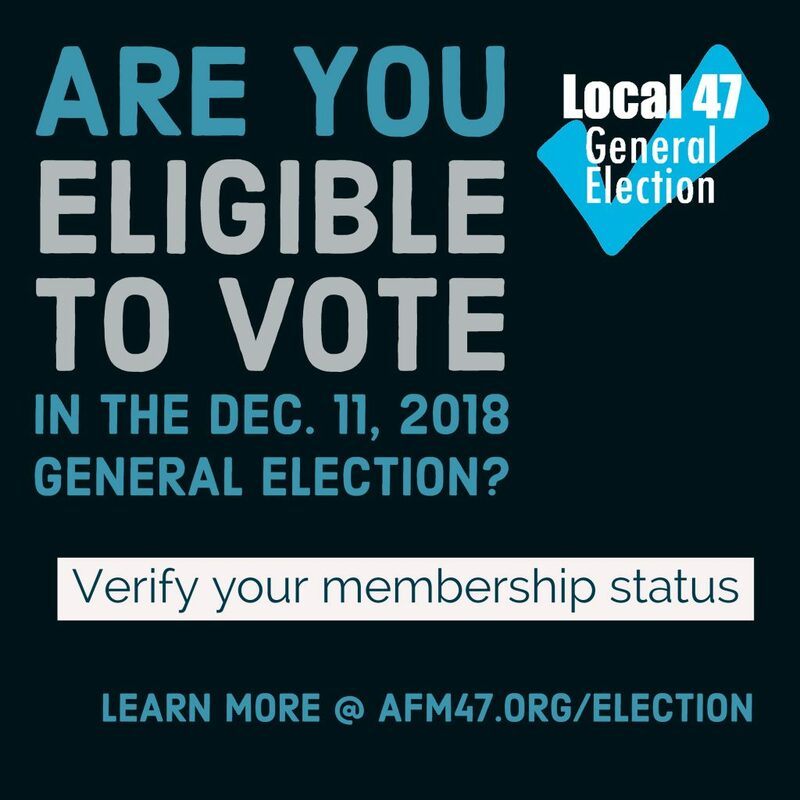 The next AFM Local 47 General Election takes place Tuesday, Dec. 11, 2018. Polls will be open from 9 a.m. to 9 p.m. at Local 47 headquarters, 3220 Winona Ave. in Burbank. Eligible voters may request a Vote By Mail Absentee Ballot by downloading the form at afm47.org/election and sending it directly to the California Elections Company. DO NOT SEND THE FORM TO LOCAL 47. Please be sure to allow ample time to send in your request, receive your absentee ballot by mail, and send it off to arrive at the Burbank P.O. box no later than Dec.11, at 9 a.m. when all absentee ballots will be collected by the Election Board. Regular and Life Members who are in good standing as of 4 p.m. (close of business) on Monday, Dec. 10, 2018 are eligible to cast a ballot. Life Members who hold Inactive status do not have the right to vote. shall have until 4 p.m. Dec. 10 by which to clear his/her delinquency and return to full good-standing status in order to be eligible to cast a ballot. This entry was posted in All News and tagged AFM Local 47 General Election on November 30, 2018 by admin.